As you know, my dream would be to run a dog rescue. Usually, we just joke about Misty having a dog rescue, but after having that Cattle Dog basically knocking on my door, I'm starting to wonder if the dogs don't already have me figured out as the rescuing type. I also recently watched a dog show on TV. Molly and I love to watch dog shows together. What? Yes, Molly watches television! Anyway, I always start excitedly talking about all the various dog breeds I would love to have as a member of my family. Of course, Hubs and Molly just roll their eyes and attempt to ignore my obsessive "and an Australian Shepard, a Golden Retriever, a Great Pyrenees, a Boxer..." Hubs is just used to this behavior. Molly closes her eyes and just prays I am going to forget about these crazy ideas, because she thinks we already have two dogs too many. You know me, I want dogs of all shapes and sizes, all colors and personalities. I'm only a tad out-of-control. One dog I would like to have is a Dachshund. No, don't go offering to send me free Dachshund puppies. Well, unless you really want to. 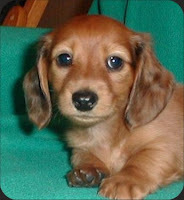 There are miniature and standard Dachshunds. Just so you know, both sizes are adorable. They are fairly small dogs, with the standard size only being 8-9 inches tall and weighing 16-32 lbs. There are also three types of coats on this breed: short-haired (as seen in the photo), long-haired, and wire-haired. They are smart dogs that learn quickly with the adequate time devoted to training (and some tasty treats, of course). Also, because of their small size, they a good indoor companion for someone with limited space. They are also a good companion for someone without an excessive amount of free-time, because the Dachshund does not require daily walks like some other breeds. Sometimes, just an inside game of ball will satisfy these cute dogs' exercise needs. So, that's a little about the Dachshund dog breed. Did you like this dog breed review? Should I do more of these? Or, do you secretly wish I would just shut-up about dogs already? Be straight with me; I can take it. My sister has one of these (a mini)! I remain, however, a devoted fan of the Aussie. But after 13 1/2 years with one, I'm a little biased. I jave 7 dogs one mixed watch dog rescue 14 years old - chow- pit,one 21 year old mixed terrier, 3 rescued from Katrina ig mixes, l show ig, and a Christmas gift a mini - chihuahua pup. I love each more than you could ever imagine. they are so good to one another and throughout cancer treatment stayed close so to care for me - nothing like them- dogs that is - did the cattle dog move on?? Unfortunately, every miniature Dachshund I've ever known has been an incessant yapper. I lived next door to one, and it nearly drove me nuts. Then again, I guess the behaviour of a dog owes more to its owner than its breed. I'm not a doggy person, but I'm just as crazy about cats as you are about dogs, so I understand where you're coming from :). Keep on talking, Kid! About dogs -about anything -but about dogs especially is fine with me. I can dream then about a day when maybe I'll have a dog in my life again. It's fine with me. My kids are running a `get-us-a-dog' campaign with more zest and determination than the campaigns of Clinton and Obama! I find Dachshund cute. A family friend loves Dachshunds. They seem like a gentle breed. We have a large dog. I still have dreams of my little black dog named Rhett. Personally, I love hearing about dogs...especially something like this. I'd really love to get a dog when I move out so I'd find these little tid bits of information to be very helpful. You can talk about dogs all you want. I love dogs. I have 6 of them don't forget. I too would love to start some sort of business that involved dogs. They'd be a much better customer than some humans. Part of me would like to have a nice size dog park with a small snack shack or something where dogs and owners can take walks and enjoy the weather and sit down to a snack. I'd love it! By the way, I use to want a Dachshund. They are adorable. I do prefer the short haired though. P.S. Thanks for the hugs and thoughts. (((HUGS))) back to you! I wanted a dachshund until I worked around them. Then, no more. They reminded me too much like a Jack Russell. They were snappish in the cage and trying to be dominant when I was walking. Yeah, no thanks. I almost got bit more than once. I love Aussies, though. But I don't know if I'd be suited. I'm too lazy for all the exercise they need. I think you'd do fine with one, since you have a Border. You're used to agility type deals. We've discussed my list before. I kinda don't watch dog shows. Mostly because the categories piss me off. It seems unfair, since it's like a Beagle competing with bigger dogs. Yeah, keep going, I’d like to read MORE. With the Dachshund or Dackel as they are called in their (and my) country of origin never forget – they are BIG dogs on short legs (just as Corgies) and they are often said to be uneducatable but people forget that they were originally bread to work on their own, to make their own decisions while meeting the fox or badger (= Dachs in German) underground. So they might sometimes need a bit more motivation to do something we want but they can definitely be trained! I love the breed review! More! More! I think weenie dogs are so cute, but I'm not sure I'd want one. But maybe! Like you, I love all dogs!!!! Would love to learn more about various breeds. Love your blog post. It is an awesome story and I love puppies they're so cute and lovable. Hope to read more blog post like this. Love the puppies...thank you for sharing this. keep up the good work.